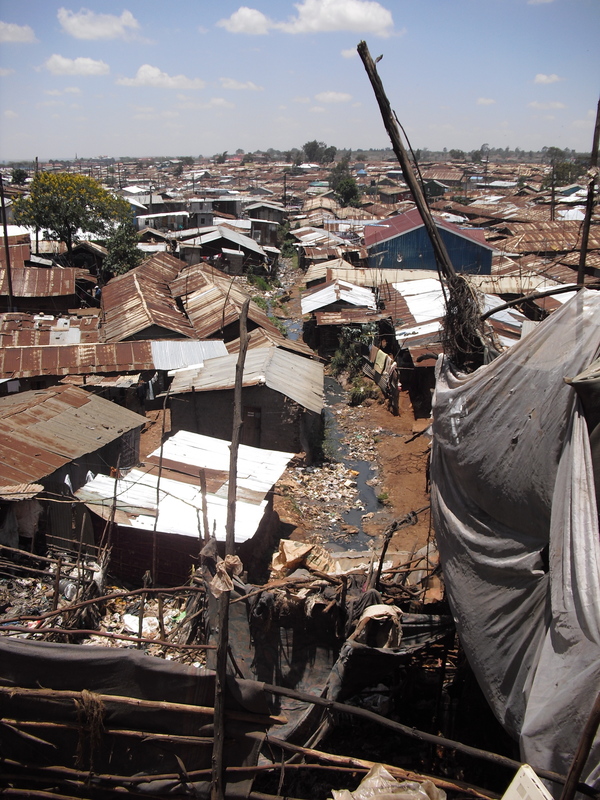 A view of Kibera, Kenya, with its one water source. Today was really hard. There is nothing that can prepare you for Kibera. 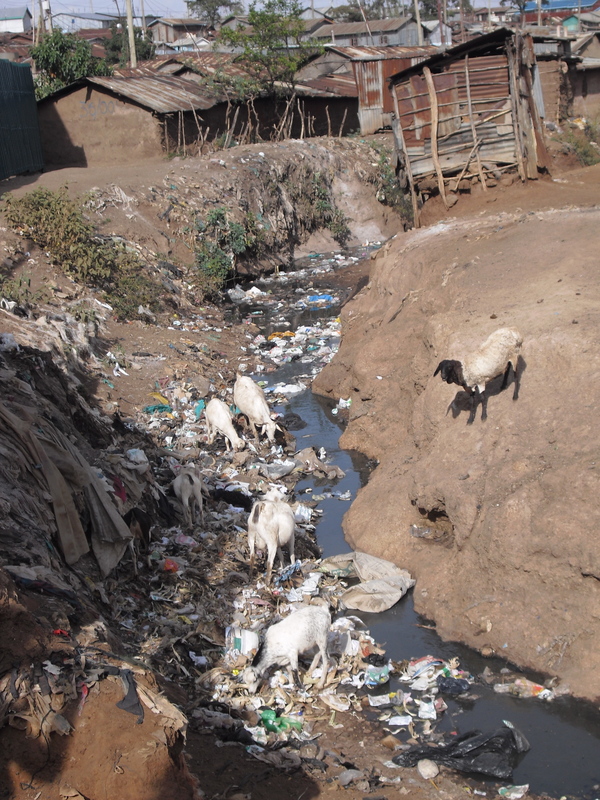 The river, the one source of drinking water in Kibera. First we drove as far as we could into the slum. The road is just wide enough for one car but there are people going to the bathroom, cooking, and hanging out in the middle of the road, so it takes about 30 minutes to travel a mile. 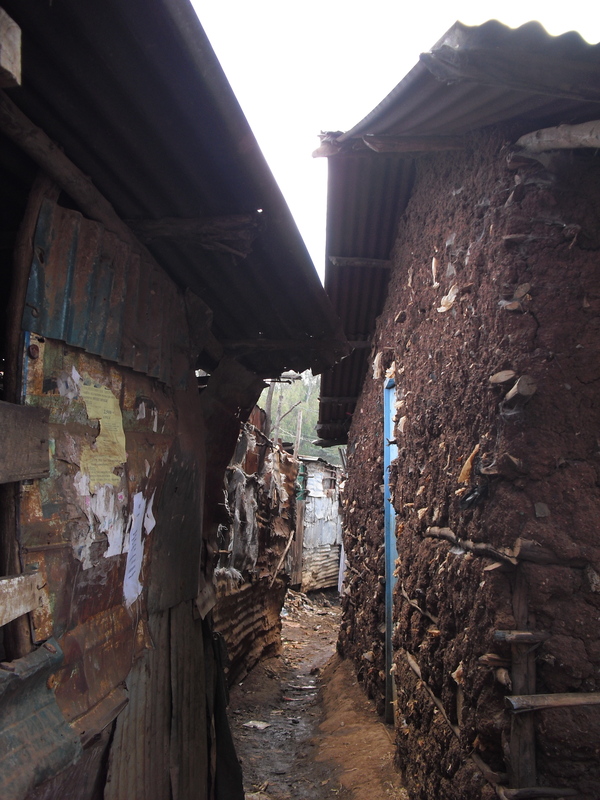 We had to walk the rest of the way into the center of the slum. 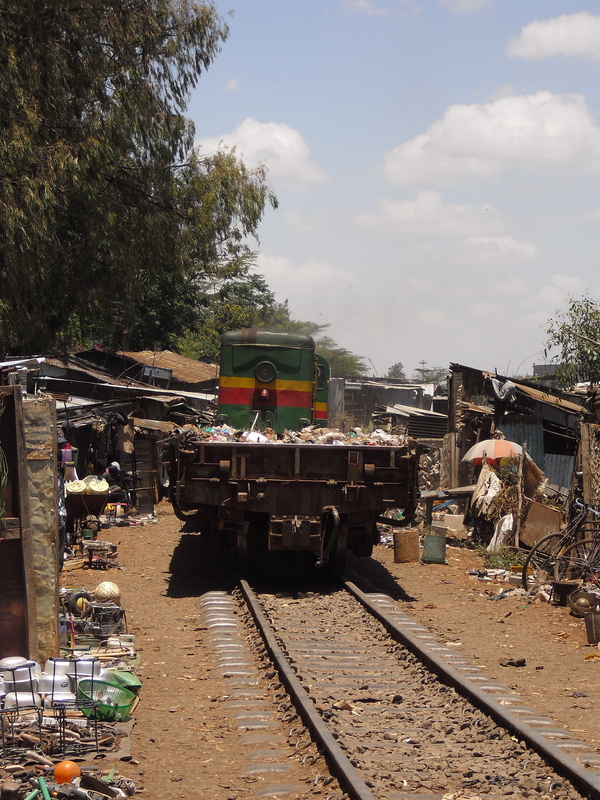 Kibera is built around train tracks, and I didn’t realize they’re still in use. We were walking along the tracks and then all of a sudden a train came and we had to rush to squeeze into an alley way to not get hit. The shacks are within inches of the train. Everything shakes, the babies start crying, the train’s horn is blaring, and you can’t imagine how loud it is. These are trains transporting garbage so as it passes the trash flies everywhere. Before the train came through, there was an open market of stales lined up on the tracks. The people have learned how to close up shop in a matter of seconds. We first visited the daycare center. There were 45 children in a room smaller than our livingroom and they were all sitting with perfect posture and asking us repeatedly “how are you?” It was hard to believe this place was an improvement for the community, but the guy who started the center said that before this place existed, mothers would mix alcohol with milk to make the babies sleep the whole day so they could go to work. 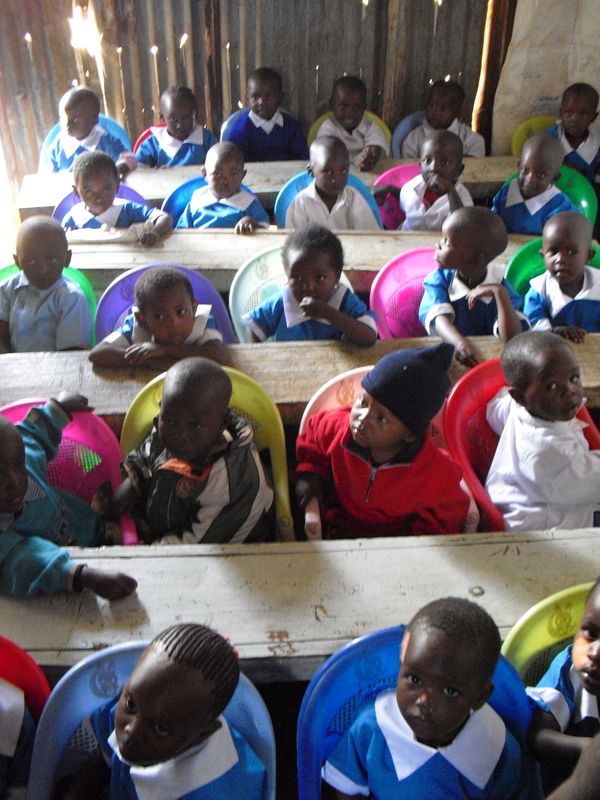 The kids have no books, pens or pencils. they just sit there for 8 or 9 hours memorizing numbers and English phrases. We’re going to get them lots of crayons and coloring books tomorrow. They stay seating like this for eight hours. Next we split up and visited three houses. The houses are all 8×8 feet with sheet metal walls and roof, and dirt floors. There aren’t any roads, just alleyways that are only wide enough for one person to walk through. There’s a constant stream of human waste flowing through the alleyways. The place smells like a mix of a sewage treatment plant and a garbage dump. The space between the houses. The wet part is sewer water. The first woman we met had four kids and her husband died 6 years ago. She had malaria and we were able to set her up with some medicine. 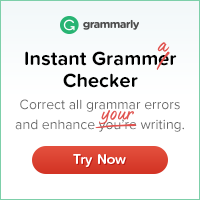 She couldn’t speak English – only people who go to school learn English otherwise they speak the tribal language (which actually has a lot of Arabic in it). She had no food in her house and had no idea when and how she would get her next meal because she couldn’t work until she got over the malaria. She said her only happiness in life was knowing that her kids would get 2 meals a day at the daycare center. If it didn’t exist, she said they would have been dead already. 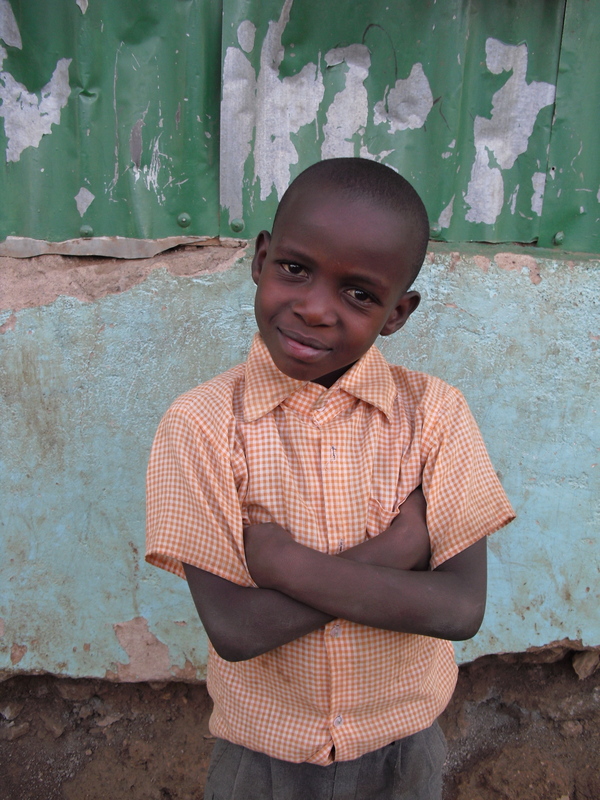 One of the adorable kids posing for us outside his house. 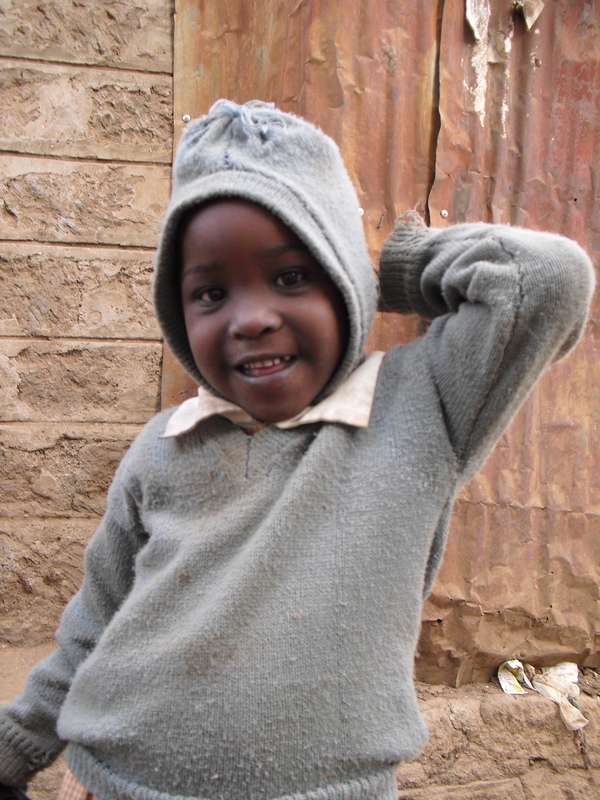 The next woman we met was HIV positive and so was her husband and youngest child. She had 6 kids. Again in an 8×8 foot house. There was no electricity. All 8 people sleep on one twin size mattress or the dirt floor. She said the childcare center was the only thing keeping her family alive. The last woman had five kids and no husband. She was really embarrassed to talk to us, and kept covering her face and crying. Her shack was downhill so when it rains her house fills up ankle-deep with sewage water. She said that before her kids were in childcare she would go out to try to find work (pretty much the only legal job the women can get there is doing laundry for a dollar a day and this work is unreliable) and if she couldn’t find work no one could eat, but now she knew at least her kids would get some food. She was 2 months behind on rent (rent’s about $18 a month) and there is nowhere else but the streets (and remember that the streets are mud alleyways filled with sewage). We left the house visits with an overwhelming sense of hopelessness. The women had no opportunities, and they had given up on their lives. They seemed to be staying alive just to make sure their kids had a place to sleep. The job site. My dad’s the one in red. Afterward we went to the site where we are building another childcare center. It was really motivating to meet the mothers and hear how crucial these centers are for their survival. We were digging the foundation and we dug like our lives depended on it because we knew that their lives depended on. 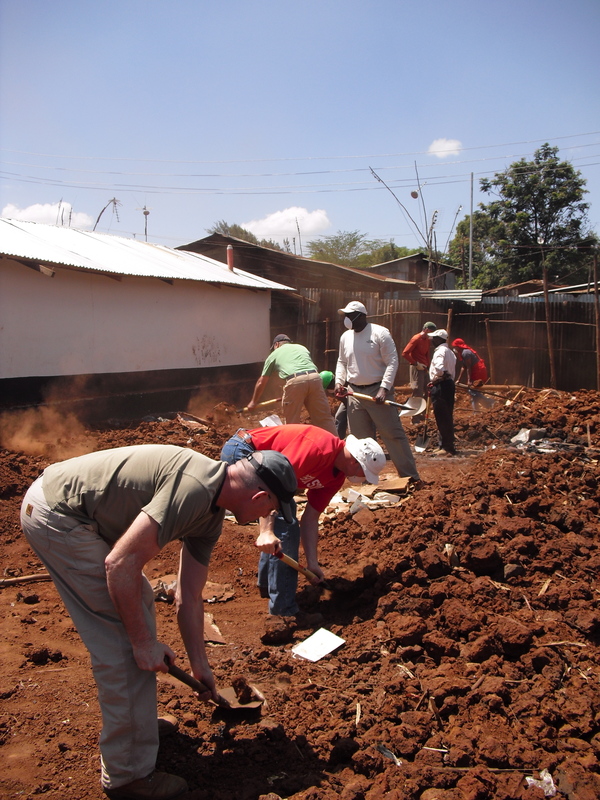 There were three construction workers from Kibera working along side us and afterward the thanked us for coming all this way to help them. One man had a tear in his eye when he thanked me. One person told me that a lot of Americans do slum tourism where a bus will drive a huge group to the edge of Kibera, everyone will get out take pictures and then immediately leave. He said he didn’t believe we would actually stay and help build with them. We spent the whole afternoon clearing away rocks from the job site and burning the junk that was embedded in the ground. When we walked out of the job site, the kids who were trying to hold our hands on the way in took one look at us and ran. My dad got obsessed with cow hoof soup. We saw a man making it in a giant vat on our way out. He had about 5 cow legs in the vat and he boils it down for three hours.It becomes really thick. After he sells the soup he’ll sell the leftover cow bone to jewelers who make jewelry out of it.